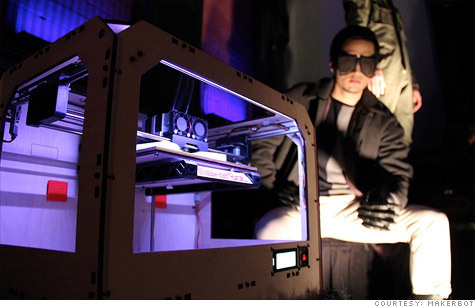 A model poses next to a MakerBot printer wearing 3D printed glasses. NEW YORK (CNNMoney) -- The hottest accessory on the runway at Fashion Week is a creation from one of New York's buzziest tech startups: 3D printed glasses from MakerBot. At designer Asher Levine's fashion show, models donned multicolored glasses fabricated in a MakerBot printer. The device allows users to download and scan designs, which are then "printed" as physical objects. Levine, who has dressed fashion icons like Lady Gaga, incorporated the printers into his presentation. Featuring a sculptural aesthetic with lots of leather and jagged edges, his collection paired well with MakerBot's industrial vibe. Levin said integrating the technology altered his view of design. "It makes you change the way you look at the process," said the 23-year-old designer. "Your product is a reflection of the tools you have. This is a new tool for people to make objects. You don't have to have eight years of schooling ... people are going to start to make their own things." Levine envisions a future where shoes and outfits are printable and artists' ideas can be designed and digitized, placed in MakerBot's "Thingiverse," and immediately made accessible to consumers. Those with 3D printers could download the designs and fabricate their own wardrobe. MakerBot founder Bre Pettis, who launched the Brooklyn-based company three years ago to commercialize 3D printing technology, thinks the Thingiverse will help make fashion more widely accessible. "Sharing came to music 10 years ago, sharing came to movies and television in the past years, and now sharing is now coming to things," he said at Levine's show. "Up until now, you've got to go to a store and buy things. Now you can come to a fashion show and print Asher's glasses." MakerBot has grown into one of New York's most talked-about about startups, expanding from two to 80 people since its 2009 launch. The company has sold more than 10,000 MakerBots, which start at $1,100. "We're bursting at the seams," said Pettis, mentioning the company's 30 job openings. MakerBot's Fashion Week debut came about through serendipity. While working on his glasses design, Levine had a vision: "Why can't you sculpt it, scan it, and print it?" To answer his question, he Googled "3D printer, NYC." MakerBot popped up. Pettis says it's not the first time an artist has approached the crew. Sitting in the Jefferson Market Library, the site of Levine's show, Pettis pointed to the library books lining the shelves. "You can download designs, just the way you can read any of these books," Pettis said. "For artists, it's a great way to get their work out there -- 'here's 10,000 places where my art can infiltrate the world.'" MakerBot's roots are in the hacker community, and the company's ethos has a strongly open-source slant. All of the designs available in the Thingiverse are free -- something the company has no plans to change. Levine is donating the blueprints for his glasses. "It's going to be a challenge to capitalize on downloaded digital object," he acknowledged. But he's willing to try. "It's all about adapting to new technologies," the designer said. "It'll totally transform my entire world."